It's been a strange week weather-wise. Monday and Tuesday's cool days and downright chilly evenings forced my book club meeting indoors, but by Friday we had the windows open and were dining on the patio again. During the brief cold snap, I was craving more Salsa Chicken and Black Bean Soup, but Wegmans was out of boneless chicken thighs. I bought the bone-in variety with every intention of doing the de-boning myself, but by the time I got home that seemed like too much work and I decided to search for an alternate recipe. 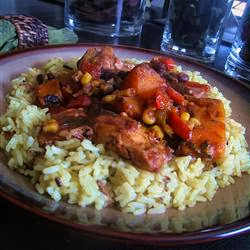 Slow Cooker Latin Chicken from allrecipes.com looked pretty good. I didn't have quite enough chicken, but slow cooker recipes are pretty loose so that didn't deter me. 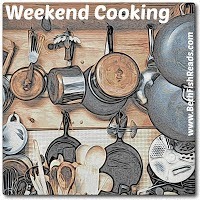 Everything else was prepared strictly by the recipe... except for the cooking temperature. I didn't think the sweet potatoes would be fully cooked after four hours on low, so I set my crock pot to HIGH. We were pleased with the outcome. The chicken disappeared quickly (we only had four small pieces) and there was enough leftover black bean/sweet potato mixture to use in another meal. My daughter suggested serving ground turkey or beef over rice and topping it with the warmed leftovers. I think that's a great idea! Since I forgot to take a picture, the above photo is from the allrecipes website. We did not serve the Latin Chicken over rice. I made a green salad instead. 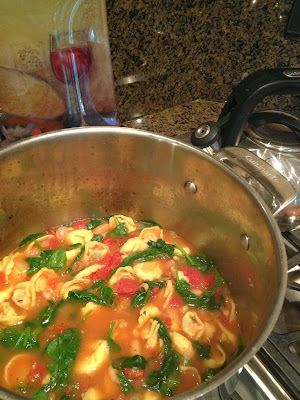 This morning I was still craving soup and decided to try Quick and Easy Tortellini Soup from the baker chick, a recipe I pinned earlier in the week. I followed the recipe exactly as written and chose to use Wegmans fresh beef-stuffed tortellini. My sample was delicious. I can't wait to serve it up with fresh grated Parmesan cheese and Italian bread for lunch! That looks like some good cooking! We had my husband's chicken cacciatore last night -- which isn't like anyone else's because he doesn't like peppers. Tonight it will be the veggie pasta that I make up on the fly and wrote about for Weekend Cooking last month: http://www.joyweesemoll.com/2013/08/24/weekend-cooking-veggie-pasta/ I'll be using eggplant from my garden, tonight, and maybe one more time before that source goes kaput for the season. Joy - That veggie pasta really is an outlet for creativity... it sounds delicious. I love eggplant. Wish my husband liked it, I'd eat it much more often. I love torellini soup! I think I may have to make this one this week. I am going to start baking bread this coming week. It's finally cool enough to turn on the oven. Beth F - It's just about time for me to get started on my bread project, too. I want to become more comfortable with yeast breads this winter. I swear I'd have boneless chicken thighs shipped to my house by the 50lb box load if I had room for them and I could make it happen. Love them so much more than breasts; so much more flavor. Lisa - I almost always use chicken thighs in soup... they're so much tastier! I need to restock my freezer soon. Oh, I am trying both of these recipes; they look so good. I love the fall weather and all of the good food that comes with it. Diane - They were both pretty easy, too. Hope you like them! Carole - I make another tortellini soup that uses rotisserie chicken and cheese tortellini... just as easy, but a nice variation on the theme. Heather - It's a perfect soup for the cool weather we've been enjoying. I think I need to invite myself over to your house -- these dishes look delish. Autumn's here -- perfect soup weather :). Oh man, it's yucky here so I really want some of that soup! Kathy - It was pouring all afternoon, so the soup was perfect! Chicken dish looks lovely - really shouldn't browse blogs when I'm hungry! it is that time of the year to start cooking the heartier dishes. Esme - It is... love that comfort food! JoAnn, I reprinted the chicken recipe from you. Can't wait to try it. Pinned the soup too! Peggy - I hope they turn out just as well for you! Those look pretty tasty and easy--perfect combo! Kerry Ann - I was very pleased with both of these recipes! Colleen - Both are perfect for chilly evenings. Stews and soups are so enticing right now, but it is still hotter than blazes here and I can't heat up my house if I want to be able to have sanity :-) I can't wait til a month or so when stews will not seem like a ridiculous idea. I was craving soup this weekend but didn't get any. I have to make my soup from scratch because nearly every prepared version out there seems to contain gluten but I didn't have the time this weekend to do much of anything. Maybe next weekend. That soup looks really good. I love soup and that soup looks so yummy. Now with winter fast approaching I'm looking for new soup recipes and I like homemade as canned has way too much salt. I may have to give this one a try. Darlene - The amount of sodium in canned soups is shocking! I don't buy them at all any more.